Shiv Kapur is the latest entry to the list of Indian golfers. He was born on February 12, 1982. After dominating the Indian Amateur circuit, he became professional golfer in 2004. 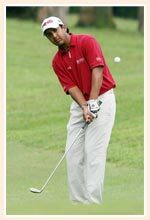 As an amateur player, Kapur achieved victories in the Indian Amateur Open and Malaysian Amateur Open in 2000. Later, he went to the US and enrolled in the Purdue University. There he pursues his studies as well as play in the U.S. amateur circuit. The most remarkable achievement in the career of Kapur is the gold medal that he earned at the Busan Asian Games in 2002. He became the second Indian golfer to win the event at the Asian Games after Laxman Singh.